Trumbull's Travis Longo, in black, and Danbury's Liam Knight, in white, wrestle in the 113 pound weight class during a match between Danbury and Trumbull high schools, Wednesday, January 16, 2019, at Trumbull High School, in Trumbull, Conn. 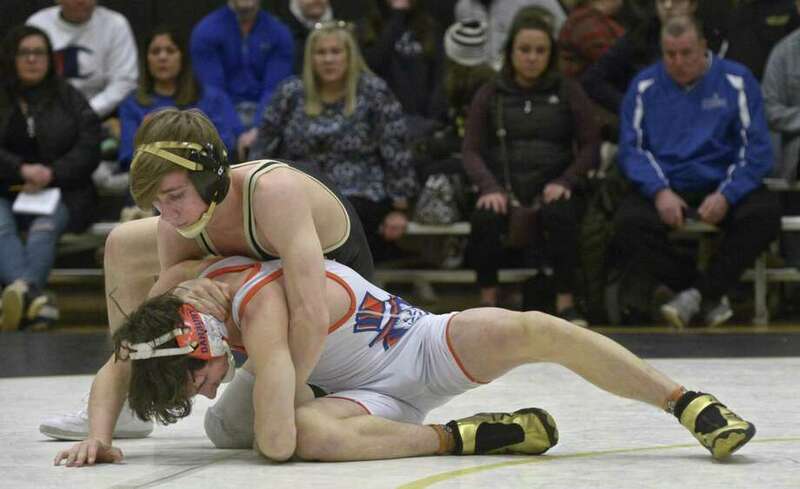 The gym at Trumbull High School typically blasts hip hop music during wresting practice as athletes work through the grinding hours honing their craft. That is until senior Travis Longo arrived. Now the tune is a little different. A change in scenery has done nothing to slow down Longo, who has been virtually flawless for the Eagles on the mat this winter. Now at Trumbull after transferring from Wilton for his final year of high school, Longo has fit right into one of the top programs in the state. His mom moved to Trumbull and he has picked up right where he left off, though it wasn’t that easy a decision. He considered staying in his comfort zone. Longo was a bit nervous going from a team of less than 10 to one over 50, but those fears were eased quickly under Eagles veteran coach Charlie Anderson, who knew Longo since he was a freshman at Wilton. The Warriors were then coached by former Eagle John Foldeak. Longo’s younger brother Michael also made the transfer. He is a freshman at 106 and displays a large amount of potential, Anderson said. The two have one season together after growing up learning the sport, including qualifying for nationals together in elementary school. Trumbull — which is loaded with top talent in Matt Ryan, Jack Ryan and Joe Palmieri to name a few — sits at No. 4 in the latest CTWrestling.com Top 10 Poll after winning the Connecticut Challenge on Saturday at Southington High School. Longo, who won his 100th career bout Dec. 27 in a quad meet, won his bracket. Longo is wrestling at 113 pounds this year after winning the FCIAC, Class L and State Open title at 106 in 2018. He became the first Wilton wrestler since 1993 to win a State Open title. Now he’ll chase a piece of unique history: Two straight State Open titles in different weight classes at different high schools. With FCIACs set for Feb. 8-9, final preparations are being made for the stretch run. “I want to see him do as well as he can, and show our younger kids the way,” Anderson said. “I have a great group of seniors; I want him to continue to assimilate with the team and go as far as he can.